Zoom’s original F8 impressed us enormously — and now they’ve made it even better! The Japanese manufacturers Zoom have built a strong reputation for designing and producing very cost-effective and good-sounding location recorders. The eight-input, 10-track F8 model that I reviewed back in December 2015 has served as the range’s flagship model — and I was very impressed by the professional features and quality, which set a new benchmark for the price point. However, Zoom are not a company to rest on their laurels and now, a little over two years later, they’ve brought out an updated model, whose revisions have been made in direct response to feedback from their customers, both enthusiastic amateur and professional alike — there are a lot of professionals now using the F8! At first glance, the original F8 and new F8n appear identical; in fact both the side and the front panels are exactly the same, save for a few new panel markings. The F8n also retains all of the functions and features of the original, while introducing some neat improvements and additions. I’ll only describe the new and altered features here — you can find my in-depth description of the previous model on the SOS web site, where it’s free to view (http://sosm.ag/zoom-f8-1215). The most obvious visual difference between the two versions is to be found at the back, which has been completely revised to accommodate a new internal battery arrangement. The original model used a bespoke caddy to store eight AA cells, which had the benefit of allowing a new pre-loaded caddy to be installed very quickly if required. The downside was that if it was dropped and damaged it became impossible to load new batteries until a replacement was obtained. The new F8n does away with the caddy completely, and a hinged metal flap on the bottom opens to reveal a standard tray for eight AA cells. It takes slightly longer to replace them, obviously, but there’s nothing to lose or break. As most professional users employ an external battery pack (connected via the industry-standard Hirose four-pin socket), the internal AA batteries mostly serve as a backup power source, and so a speedy swap-out is less important. I prefer this new configuration. To accommodate this new battery tray design, the timecode input and output BNC connectors have been moved up to sit horizontally alongside the 12V DC input (for the supplied mains PSU), and the 10-pin proprietary mic connector has also been raised and rotated. Before I get into the detail of the functional changes and improvements, I should mention the changes to the list of included items in the box. The original F8 came with a mains power supply, battery caddy, camera-mount adaptor, TA3 output cables, download codes for both Cubase LE and WaveLab LE, and the Operation Manual. Obviously the new F8n doesn’t use the battery caddy so that’s gone. So too has the camera-mount adaptor and, more disappointingly, the TA3 output cables. I presume these have been omitted because most users don’t require them — they’re both now available as cost-options, of course. So the F8n just comes with the mains PSU, Operation Manual, and software download codes. A couple of invisible but useful modifications relate to the input and output connectors. On the original F8, line-level input signals could only be connected via the TRS part of the ‘combi’ XLR sockets, and mic levels only on the XLR part. The F8n has gained a menu option which allows the user to select mic or line input levels regardless of which connector format is used (although it’s worth noting that, very sensibly, phantom power is only present on the XLR connector). So if you happen to have a line-level signal on XLR there’s now no problem plugging that straight in. While the shorter side panels of the F8n are the same as on the original F8, there are improvements behind the scenes — for example to the headphone amp. 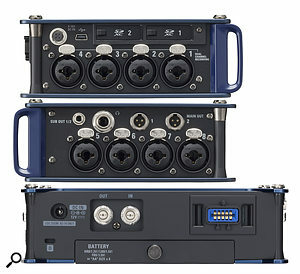 On the longer panel you can see the much-improved battery-clip arrangement.And assuming that a set of TA3 output cables have been acquired, the main outputs can now be switched between nominal consumer (-10dBV) or professional signal levels (+4dBu), the latter option providing the industry-standard +24dBu for 0dBFS — which is very impressive from a battery-operated machine. The original F8’s main output offered only consumer (-10dBV) or mic levels (-40dBV), which was rather restrictive if you needed to hook up the F8 for replay through a professional system. Sensibly, the Sub-Out mini jack is unchanged, though, and still provides either -10dBV or -40dBV nominal levels — the latter level being handy when feeding some DSLR cameras. The next upgrade comes in the form of better stability of the timecode generator when the F8n is powered down. It was found that the original F8’s timecode generator could drift when the unit was powered down, requiring regular ‘genlocks’ to resynchronise it with the timecode generator in videos camera etc. I’ve already mentioned the changes to the internal AA battery storage, but another important alteration is the voltage range that can be accepted on the four-pin Hirose external DC input connector. The original F8 accepted 9-16 Volts DC, but some types of external battery pack could exceed that when freshly charged (a four-cell 14.4V lithium-ion pack, for example, which reaches 16.8V straight off the charger), so Zoom have expanded the F8n’s DC range to 9-18 Volts, improving compatibility with a greater range of external power sources. Another power-related upgrade is the provision of USB bus-powering for the F-Control remote fader panel. This optional but extremely useful accessory was introduced much later than the original F8, and had to be powered by internal or external batteries when used with that recorder. However, when used with the later Zoom F4 it could be bus-powered over the USB connection, and that feature has been ported into the new F8n as well, making for a much neater and more convenient setup. Zoom have also introduced some revised display screens into the F8n (the review model was running on v1.01 firmware). For users upgrading from the original F8, the main display can be configured to look and work in much the same way if desired, but the new standard main display page makes a lot more sense to me; it’s much easier to use, and I found it a lot more intuitive than the F8’s operating system. The display is dominated by eight vertical mix faders, which are controlled directly by the panel rotary controls to adjust each channel’s contribution to the stereo mix. A clear bar-graph meter runs alongside each fader to show the channel’s signal level, while another vertical stereo meter at the right-hand side shows the stereo mix levels. Below each of the channel faders on the screen are indicators for the limiters and phantom power (but not the high-pass filter), and a virtual knob to indicate the input gain trim setting, which can be selected and adjusted with the menu encoder knob to the right of the screen. I wasn’t particularly impressed with the hybrid limiters in the F8, but the system has been enhanced in the F8n by adding an ‘Advanced’ menu option which activates a ‘look-ahead’ function. Normally, activating the limiters causes the analogue signal gain to be reduced by 10dB, increasing the front-end headroom, and 10dB of make-up gain is added digitally. The limiting action adjusts this digital gain to avoid overloads — hence the ‘hybrid’ moniker. The advanced option (which is available for base and double sample rates but not 192kHz) does the same thing with the addition of a 1ms delay into the recorded signal path for every channel, so that the limiter side-chain sees any transients fractionally in advance of the recording and can dial in the appropriate gain reduction before it’s needed, providing a much more effective and transparent limiting function. I found this to work remarkably well in practice, although it obviously adds to the monitoring latency and could potentially cause comb-filtering issues in some exacting situations with any sound leakage into the headphones from the real-time ambient sound. Talking of headphones, I think most F8 users would agree that the headphone amp was the weakest link in the original machine’s impressive capabilities. It was noisier than it should have been and the tonal quality seemed dependent on the headphone impedance. So I’m pleased to report that the F8n has been substantially improved in these respects. In fact, the headphone provision more generally is much better. Additional new headphone functions include the ability to change the response of the headphone volume control with three curves (linear, A, or S profiles), and up to 24dB of digital gain can be wound in to allow substantial monitoring levels even when recording with generous headroom margins. There are two more new functions of note. First, while the F8n still has two internal SD card slots (allowing simultaneous duplicated recordings), it is now possible to record to one internal SD memory card as well as over the USB connection to an external computer (instead of the second SD card). This increases the machine’s flexibility considerably, not least in allowing real-time streaming, for example. Secondly — this will no doubt be the star feature for many — an auto-mix function has been added. Like the look-ahead-limiter option, this is only available in base and double sample-rate modes, and cannot be used if the Ambisonic decoding function is activated. It also introduces a 2ms processing latency. However, the idea is to maintain an even background sound level, and minimise spill coloration by automatically turning down any active mic channels with no significant input signal. If more than one mic has significant signal the gains are automatically balanced to maintain a consistent background noise level. Of course, auto-mix facilities have been around for decades — Shure’s SCM810 and SCM410 Intellimix analogue processors, for example, and the Dan Duggan YGDAI card for Yamaha’s digital consoles — but it was expensive, and digital signal processing can now do a better job for free. It’s becoming a standard facility in the latest generation of digital mixing consoles, but this is the first time I’ve seen it featured on a location recorder, and Zoom’s interpretation of the concept works remarkably well. Not surprisingly, the Zoom F8n is a little more expensive than the original F8 (which remains available), but it’s not enough of a premium to be significantly off-putting to most potential customers. In fact, the price can be easily justified by the inclusion of the auto-mixing, look-ahead limiters, much better headphone amp, and improved GUI. It’s a shame that TA3 output cables are no longer included — you’ll need to budget an additional £50$60 or so for those if you want to use the main outputs for real-time replays! Since the original F8 launched, other manufacturers have pushed the location recording bar up a little higher — most notably Sound Devices, with their MixPre range. Given the choice, for example, I’d certainly have a very hard job deciding between the Sound Devices MixPre6 (with the optional M software) and Zoom’s F8n. But while these two machines are roughly comparable in price, they differ significantly in their features and capabilities — both are utterly superb for their intended applications. While I was “deeply impressed” by the original F8, the improvements introduced in the F8n take this miniscule multitrack location recorder to another level entirely. This model builds very strongly on its forebear’s proven capabilities, and not only does it not throw anything away — which means it should appeal to potential upgraders — it adds a range of genuinely useful new features and facilities. Zoom continue to go from strength to strength, and it’s great to see them responding so attentively to the user feedback they’ve received. The strongest competition for the F8n (other than Zoom’s slightly lower-priced original F8) now comes from the Sound Devices MixPre range, and particularly the MixPre-6 (or -6M if video synchronisation isn’t required). Retains all features and specs of the original F8, including the superb mic preamps. Both XLR and jack inputs for line-level sources (no adaptors required). Headphone amp notably improved and more powerful. Updated GUI is easier to use. New auto-mix facility and improved hybrid limiters with look-ahead function. Can record simultaneously to one internal SD card and a computer over USB. TA3 output cables now a cost option. A modest price increase over the F8. This astonishingly compact eight-input, 10-track solid-state location recorder has raised the bar once again, receiving a range of improvements largely inspired by user feedback to deliver an even more impressive performance and even greater facilities. Zoom North America +1 631 542 5270.